It took a long, long, long time—years even—but T-Mobile announced it'll finally offer the iPhone 5 on April 12 for $99 down, with monthly payments after that. Apple's flagship device is about five months old by now, and in its sixth iteration to boot, but that likely won't mean squat to T-Mobile customers. Everyone holding their breath can now let out a big sigh and shout hallelujah. Now that T-Mobile has stated its intentions to ditch the two-year contract model, anyone dreaming of owning an iPhone without the suffocation of a commitment can do so. If you choose the company's Simple Choice Plan, once you pay the down payment of $99, customers are required to pay $20 per month for the next two year attached to your existing bill. Basically, the unsubsidized price is paid out in installments, taking the sting out of a lump sum. Whether that's a better longterm investment over a two-year contract remains to be seen. "We're rewriting the rules of wireless to provide a radically simple, affordable iPhone 5 experience — on an extremely powerful network," said T-Mobile CEO John Legere. Alongside the iPhone 5 announcement, T-Mobile also announced the rollout of its LTE network, which will first be available in Baltimore, Houston, Kansas City, Las Vegas, Phoenix, San Jose and Washington D.C. Couple that with the carrier's extensive HSPA+ coverage, which is LTE-like, and iPhone 5 users will always be connected to a fast network, even if LTE drops off in some areas. The Simple Choice Plan begins at $50 per month for unlimited talk, text and Web (500MB of data), with the option to add 2GB of data for $10 per month or unlimited for an extra $20 per month per line. T-Mobile has laid everything on the table, and it's clearly intent on attracting consumers over to its fancy new UNcarrier plans with Apple's iPhone 5. Customers have been abandoning ship for years because T-Mobile never offered the iPhone. Will this change the carrier's fate? We'll have to wait and see. NEW YORK — March 26, 2013 — Consumers will have a new affordable, unrestricted and hassle-free way to buy an iPhone 5 when T-Mobile USA, Inc. begins offering the revolutionary phone on Friday, April 12. "This is an important day for people who love their iPhone but can't stand the pain other carriers put them through to own one," said John Legere, president and CEO of T-Mobile USA. "We feel their pain. I've felt the pain. So we're rewriting the rules of wireless to provide a radically simple, affordable iPhone 5 experience — on an extremely powerful network." iPhone 5 is the thinnest and lightest iPhone ever, completely redesigned to feature a stunning 4-inch Retina display, an Apple-designed A6 chip for blazing fast performance and ultrafast wireless technology1 — all while delivering even better battery life.2 iPhone 5 comes with iOS 6, the world's most advanced mobile operating system with over 200 new features, including Shared Photo Streams, Facebook integration, all-new Maps app and Passbook organization, and even more Siri features and languages. With compatibility on T-Mobile's 4G network, iPhone 5 customers will enjoy a consistently outstanding wireless experience, seamlessly connecting to both T-Mobile's existing nationwide 4G and growing 4G LTE networks. Today, the company launched 4G LTE service in seven major metropolitan areas, including Baltimore; Houston; Kansas City; Las Vegas; Phoenix; San Jose, Calif.; and Washington, D.C. T-Mobile's 4G LTE network is expected to reach 100 million people by mid-year and 200 million nationwide by the end of 2013. The company's 4G HSPA+ network reaches 225 million people in 229 metropolitan areas. T-Mobile's new Simple Choice Plan starts with a base rate of $50 per month for unlimited talk, text and Web with 500MB of 4G data.3 Consumers can add 2GB of 4G data for $10 per month per line or get unlimited 4G data for an additional $20 per month per line. Customers can add a second phone line for $30 per month, and each additional line is just $10 per month. There are no caps and no overages. · HD Voice – delivering nationwide crystal-clear high-definition calling and significantly reduced background noise. 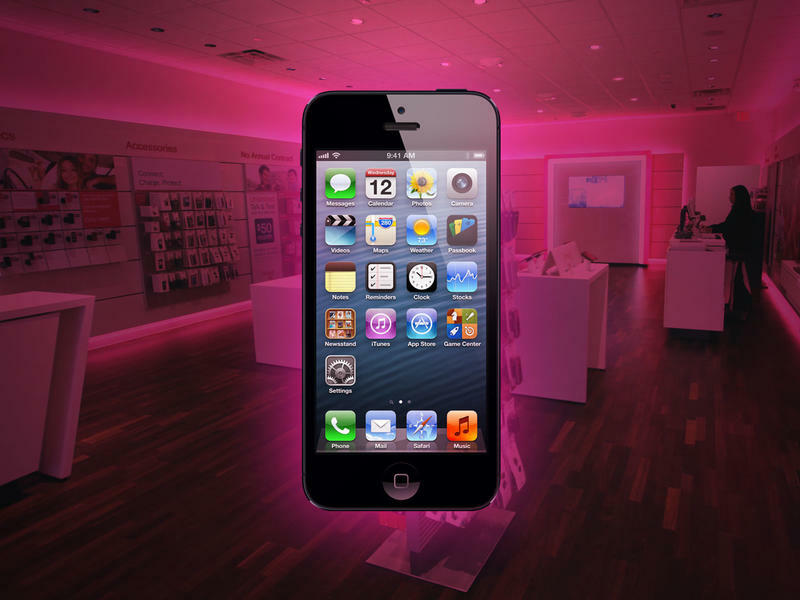 T-Mobile is the only U.S. carrier offering nationwide HD Voice for iPhone 5. · T-Mobile Smartphone Mobile HotSpot for on-the-go tethering Internet access. Through Simple Choice, T-Mobile offers an additional 500MB of 4G data for tethering, enabling customers to tether from their iPads, Macs and other devices. · Talk and surf at the same time — without limits. Through T-Mobile's Simple Choice Plan, customers can opt for totally unlimited 4G data on a nationwide network, something no other major U.S. wireless company offers for iPhone 5.
iPhone 5 will be available for qualifying customers with T-Mobile's Simple Choice Plan for $99.99 down and $20 per month for 24 months. Qualifying customers can get iPhone 4S through the Simple Choice Plan for $69.99 down and $20 per month for 24 months. iPhone 4 will be available for qualifying customers through the Simple Choice Plan for $14.99 down and $15 per month for 24 months. Financing is available on approval of credit online and in participating locations. iPhone 4S and iPhone 4 will be available in select markets. iPhone 5 will be available nationwide on Friday, April 12, at T-Mobile retail stores and through select dealers and national retail stores, as well as online at http://www.T-Mobile.com. Customers can pre-order iPhone 5 beginning Friday, April 5. For more information, visit the pre-registration page.